Constructed with excellent workmanship, advanced and attractive design with high level of reliability. 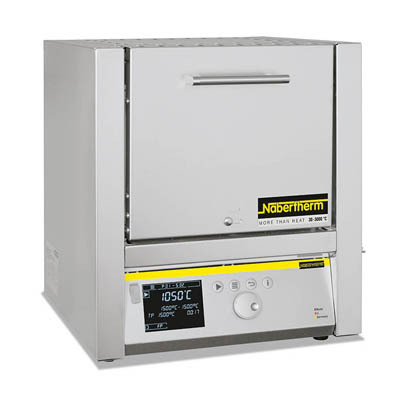 Nabertherm™ Muffle Furnace is equipped with a flap door that doubles as a work platform. Max Temperature: 1100 or 1200 °C. Ceramic heating plates include integral heating element which is easily replaced. Highly durable cured vacuum fibre module lining. Casing made of sheets of textured stainless steel (non-rusting design). Double-walled casing for low external temperatures and high stability. Adjustable air inlet integrated in door. Exhaust air outlet in rear wall of furnace. Silent solid-state power control relay.